All 4-H programs focus on active involvement and quality experiences which stimulate lifelong learning of values and skills. 4-H members learn valuable lessons in leadership, communication and collaboration while increasing their knowledge in math, science, technology and a variety of other topics. 4-H creates fun while learning in a variety of ways. Kids can participate in 4-H through community clubs, camps, in-school and after-school activities, and summer programs. They increase their self-confidence and personal life skills while learning about specific subjects - anything from animals or computers to public speaking, cooking, art, gardening and environmental sciences, just to name a few project topics. Kevin Harris is the 4-H Youth Development educator for Butler County. You can contact him at 513-887-3722 or harris.2184@osu.edu. 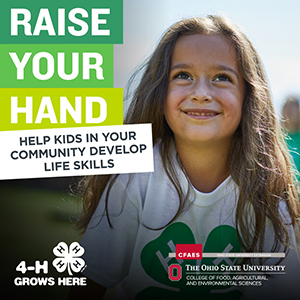 You can also learn more about all OSU Extension 4-H youth development programs at http://ohio4h.org. Extension has been helping all Ohioans build better lives, better businesses and better communities since 1914. Raise Your Hand and help us win $20,000 to support 4-H programs in your county! 4-H members, volunteers, families, and friends can vote at 4h.org/raiseyourhand. Make the best better and vote by May 15!